The Craghoppers Kiwi Goretex is a traditional design, walking jacket recently updated to incorporate a 2 layer Gore Tex shell. It's a good length and fits well including the sleeve length which I often find to be a little on the short side in some jackets. I liked the foldaway hood which provided good protection during some pretty heavy summer downpours - which were also a good test of the jacket's waterproofness, which it certainly passed. It has two good sized zipped side pockets. There is also an inner zipped weatherproof pocket which is designated as a map pocket - but which is actually too small for a folded OS map! The breathability was ok for me during all my low level walking trips. However, during extended higher energy periods I did find that the 2 layer Gore-Tex wasn't adequate. 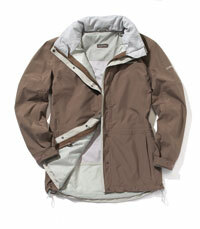 The Craghoppers Kiwi is a well-made, reliably waterproof jacket. It is a good option for low level walking /lower energy activities either on its own or as part of a layering system. However - it would certainly benefit from the addition of a pocket that really is big enough for an OS map! It also looks good enough to use for more general leisure wear.